Just heard back from ALL, Arts League of Lowell. All three of my pieces were accepted into this show. YAY!! It will open tomorrow and run through November 15th. The reception is Saturday, October 17, 4 – 6 pm. 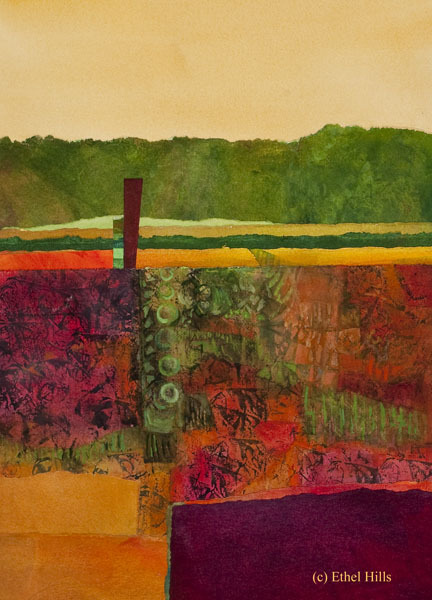 Abstractions 2015 is the next exhibit at the Arts League of Lowell, ALL. This is an open juried show. These are the pieces. Keep your fingers crossed for me. This painting is from the same series as last week’s. I hope you enjoy this painting as much as I do. To me, it’s very simple, yet embodies the feel of waves and spray. I’m not sure where this will be, but I’ll be submitting for ALL’s “Liquid Scapes” exhibit running from August 30 – September 29th. More on the exhibit next week. This is one of my pieces at the ALL Co-op Gallery in Lowell. 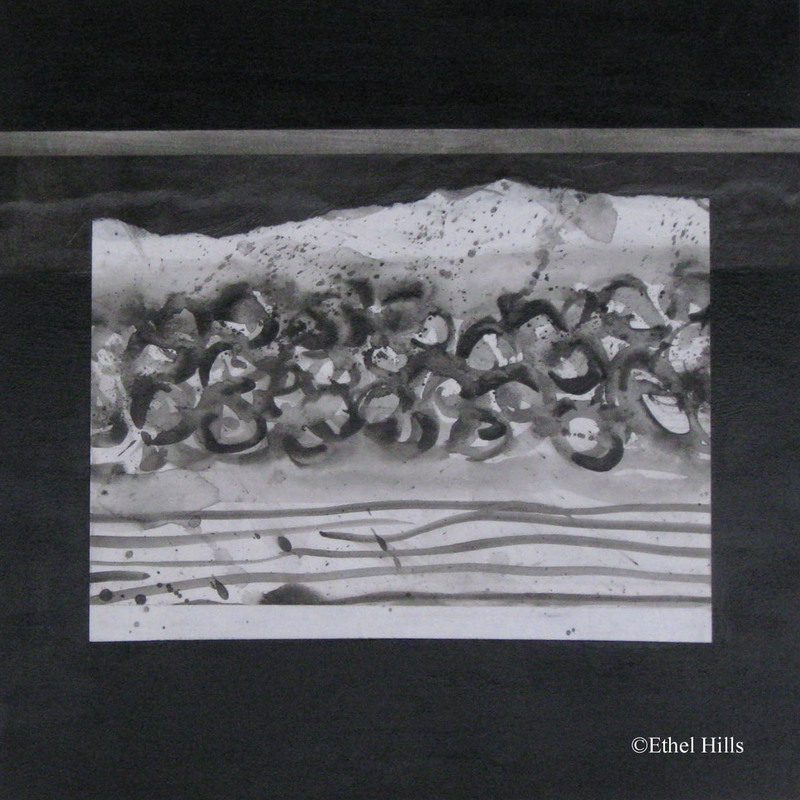 This is one of a series of paintings I did with black as the background. Most of them were just black & white, but a few were black & white and tan. It turns out that I really like that combination of colors. I’m not sure tan is the right description, but basically “brown paper” as in “brown paper bag”. Black can make almost any color stand out, but there’s still something special about combining these two seemingly neutral colors. I must say that I thought this series was at an end, but I’m tempted again to go back. I was in Manchester today at the Currier Museum of Art. One of the exhibits we saw was “Poster Mania”. A number of these posters were one or just a few colors printed over colored paper – often a tan or off white. It made me start to think of these possibilities again – black and tan, black over colors, colors printed over tan with just a bit of the tan showing through as either lines or shapes. So perhaps there are some more black and tan pieces in my future. Watch for future posts. I went in today for my first gallery sitting day. Thought you might like a peak at what my space looks like. (Unfortunately, I couldn’t seem to get away from the glare and reflections from the windows.) I think this is going to be a great experience. The rest of the work in the gallery is wonderful. It’s a great mixture of painting, photography, textile art, jewelry and ceramics. This is a great place to buy a gift for yourself or someone else. All set for Mother’s Day?? The exhibit in the ALL gallery space is “The Collectors”. I love this idea. They asked several of their collectors to pick out some pieces from their collections to be displayed for the month. Then they asked the artists represented in this selection to also bring in a piece for the show. Most of the second group are for sale. It’s very interesting to see what folks have collected, but having other pieces that are actually for sale makes it that much more accessible. And to prove the point, there are already 5 pieces sold. Not bad, as today is only the 4th day the gallery has been open. If you can make it, the grand opening will be this Saturday, May 11th from 7 to 10pm. This week I’m going to show you a couple of pieces which are not fresh off the easel. I’ve just hung my section of the new ALL Co-op Gallery in Lowell, MA and will share a couple of these paintings. 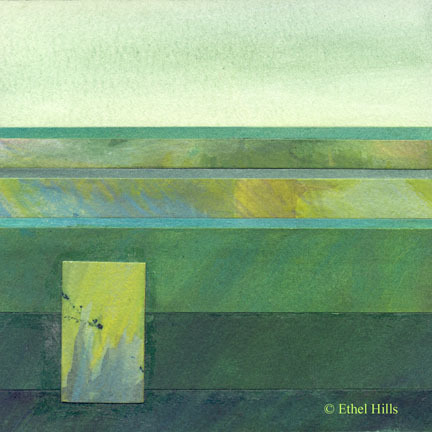 I like the combination of colors and textures as well as the very tranquil feel of the piece. As I was hanging it, I remembered how much I like this painting. It usually hangs in my studio. I think it’s a reminder of the benefit of sticking with it. 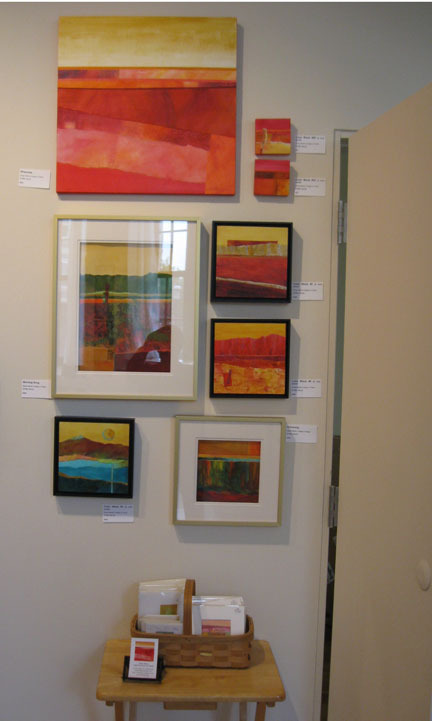 It started out with a few basic pieces – the sky, the tree line, a horizon line and the textured middle ground in reds. Those were the basics. But to this I added multiple strips to enhance the horizon, lots more texture added to the middle ground, bits & pieces to build the foreground, and then a few vertical touches at the horizon line. It seems like I worked on it and worked on it, but maybe that’s not accurate. I certainly tried all kinds of combinations trying to come up with the perfect solution. Although I know there is never a “perfect” solution, there is often an aha moment when something clicks and the piece is noticeably better. Suddenly the parts of the painting coalesce into something more than the sum of the parts. The much smaller vertical red piece near the horizon was one of the last pieces I added. I like the way this small hit of red ties the piece together. There are just so many little touches in this piece that I really enjoy. I’m going to miss this. It usually hangs in my studio. Hopefully, it will find a better home than my studio and bring light into someone else’s life. This is a small matted piece. It’s approximately 3″ x 3″ in a 6″ x 6″ mat. I have a small basket with several of these small matted pieces and a selection of hand-painted cards. In terms of process, this piece is the opposite of Morning Song. This piece just kind of fell together. I love the colors and textures, right down to the very thin yellow gold line. 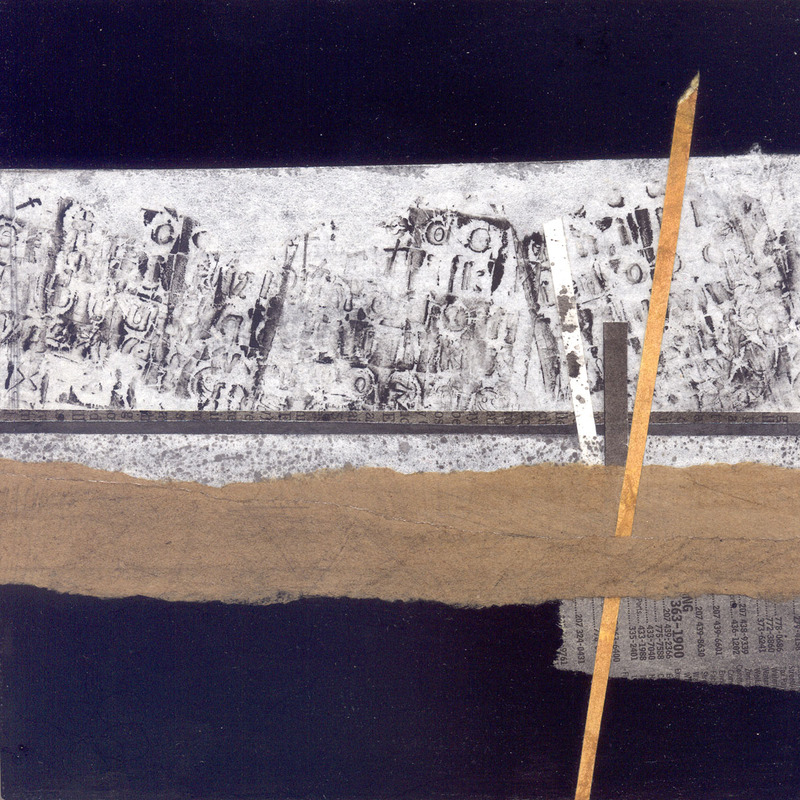 The suggestion of landscape without anything explicit makes it somehow more universal. It clearly isn’t a realistic depiction of a specific place. Perhaps it is a representation of a time of day or perhaps even a state of mine as well as a sense of landscape. What do you see? Both of these pieces are for sale at the new ALL Co-op Gallery at 307 Market Street, Lowell, MA. Gallery phone 978-221-5018. Gallery Hours: Wednesday – Saturday 12 to 6 and Sunday 12 -4. Our official opening will be Saturday the 11th. More details to come. Well it’s the first week of the month again. That’s generally change over time for exhibitions. At NHAA in Portsmouth, the Lassonde exhibit came down this weekend and Art & Artisanship went up yesterday. Art & Artisanship is a collaboration with the New Hampshire Furniture Masters Association. I believe this is the 3rd time we’ve invited the NH Furniture Masters into our gallery and it’s one of my favorite shows. The combination of fine art alongside fine furniture is quite exciting. If you’ve never had a chance to check out any of their exhibits, please get over to NHAA’s Robert Lincoln Levy Gallery at 136 State Street in Portsmouth, NH. The exhibit will only run through the end of the month. If you have a chance, you might want to go Friday night for the opening reception, held in coordination with Art Round Town. That will give you a chance to meet and chat with the furniture masters and some of the artists. Always a fun thing to do. I have one small collage in this exhibit. I can’t wait to see where it’s located. Hint. It’s small and may be hard to find. And today is the beginning of the new ALL Co-op Gallery at 307 Market Street in Lowell, MA. I went down today to hang my 3 foot section of wall. Unfortunately, I forgot my camera. I’ll have to get you a pic when I go back down next week. We’ve got 3 days for everyone to get in and get their spaces organized. The gallery will be open for business on Saturday. The gallery will be open Wednesday through Saturday 12-6 and Sunday 12-4. 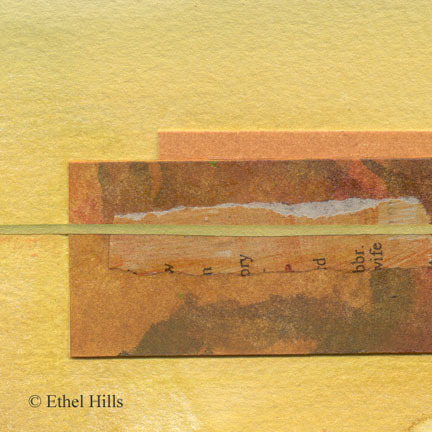 I’ve included both collages on paper, collages on panel and a selection of hand-made greeting cards. It looks like there will be some wonderful art. This will also be the permanent home for ALL, Arts League of Lowell, so there will also be group exhibits, classes and meetings in the space. I’m excited. It’s going to be fun to get to know all the other artists in the space. I believe there are 35 artists. Next time you’re in Lowell, please stop by and check it out.